All courses are considered elective options as long as prerequisites are complete, if applicable. This course will provide an overview of patient safety theory, the scope of medical errors, and new emerging guidelines and strategies to leverage patient safety concepts, reduce errors and improve patient safety. This course will provide an introduction to the concept of risk management in healthcare settings. The course will provide a historical perspective on the development of health care risk management, the role of the health care risk manager, the principles of health care risk management and the connection between risk management, quality improvement and corporate compliance in various health care settings. This course examines the ways in which patients can accept responsibility for promoting good outcomes of the therapeutic modalities that the health care professionals and institutions provide. The focus is on how patients can foster a productive relationship with health care providers and institutions, and how they can participate actively in efforts to prevent failures of quality in the provision of health care. This course is a continuation course that emphasizes the role of the legislative, executive and judicial branches of state and federal government in the establishment of standards for pharmacy practice and drug distribution. It also places special emphasis on the administrative rule making process. Additionally, the course focuses on the purpose of government agencies, the approach to standards setting by each type of agency, and the effects of regulation on public health. This course challenges students to think about the development of public policy positions and the articulation of organizational policy positions. Students will have the opportunity to develop and debate policy positions related to the supplying of pharmaceutical products and services and to decide whether specific policies stimulate or stifle the process. Channels of distribution for pharmaceutical products are examined, contrasting the flow of goods and the flow of payments. Product pricing is deliberated along with the role of comparative effectiveness research. Impact and oversight of promotional practices are considered. This course emphasizes the role of the legislative, executive and judicial branches of state and federal government in the establishment of standards for pharmacy practice and drug distribution. It also places special emphasis on the administrative rule making process. Additionally, the course focuses on the purpose of government agencies, the approach to standards setting by each type of agency, and the effects of regulation on public health. This course reviews federal Food and Drug Administration theory and practice, with a particular emphasis on product labeling requirements and the new drug approval process. The course reviews the requirements for preclinical studies, the three phases of clinical investigation, and the conduct of post marketing surveillance. IND and IDE requirements are studies. The “substantial evidence” necessary to support approval of a NDA, ANDA and SNDA are explored. The Federal Controlled Substances Act, regulations promulgated by the Drug Enforcement Administration, and judicial interpretations of controversies in this area. The “closed-system” of controlled substance distribution created under federal law. Federal restrictions on the manufacture, distribution and use of drugs that are subject to abuse. Treatment programs for the disease of addiction. This course explores regulation intended to expand access to and control the costs of health care. Students are exposed to a variety of concepts including: the obligation to provide care; state and federal regulation of private health insurance and managed care; the implications of EMTALA, ERISA, HIPAA, and COBRA; Medicare and Medicaid; technology assessment; and drug pricing and controls. This is an introduction to biomedical ethics primarily as applied to pharmaceutical and medical device products. Subject areas include the provider-patient relationship, clinical research ethics, distribution of scarce resources, ethics and industry, and beginning and end of life issues. Topics of special interest are tissue engineering and stem cells, human cloning, xenotransplantation, defining diseases, genetic testing, and genomically customized medications. Seminar is an exploration of a specific topic facilitated by a group of experts. Students are assigned reading materials and take an online quiz before attending Seminar. Facilitators will explore timely topics such as the effect of the affordable care act on the pharmaceutical industry, regulatory challenges associated with biosimilars, or recent high-profile medical errors and their impact on the health care environment. Students may choose to take required seminars during whichever semesters they choose, provided that they attend at least one on-campus seminar (spring semester) during their course of study. Spring term on campus in Gainesville, FL; Fall term online. Access to health care for the elderly and poor provided by Titles XVIII and XIX of the Federal Social Security Act. Costs and financing of the programs, eligibility, program administration, and benefits. Relationships between state and federal agencies. Proposals and prospects for fundamental program reform. HIPAA final privacy regulations. Federal anti-kickback and anti-self-referral statutes and regulations. 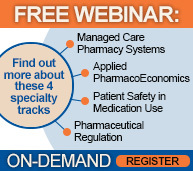 This course describes the history of the FDA and CMS. Agency organization and responsibility is explained. Administrative practices and procedures are described, including formal and informal rulemaking. The course discusses the interaction of federal agencies with state regulators. The purpose of this course is to introduce students to the fundamental methods of pharmacoeconomic analysis. The class will focus on the theory, methods, and application of technology assessment in health care. Applications will be drawn from a variety of health care settings, including pharmaceuticals. This course is designed to analyze and explore the special features and complexities of health care markets. It will focus on the analysis of consumption, production, and distribution of health and health care services with an emphasis on pharmaceutical products and services. This course will build on Pharmaceutical Microeconomics by delving into the economic principles and issues of health care in the US. Topics such as health care structure and financing, market failures, human capital, and producer and consumer behavior will round out the students’ understanding of the economics of our health care system. This course provides an overview of the False Claims Act, the Qui Tam action, and Stark Laws, within an overall framework of the prevention of fraud, abuse and waste primarily within the Medicare and Medicaid programs, as well as private healthcare plans. This course will focus on building the skills necessary to incorporate timely and rigorously analyzed medical and pharmacoeconomic literature into a rational decision making process. Students will develop the ability to critically evaluate studies published in the medical and pharmacoeconomic literature, interpret statistics commonly encountered in clinical studies, and review strategies to efficiently and effectively retrieve drug information. This course will explore the methodologies through which patient safety data are collected and evaluated. The use of existing databases on patient safety will be examined. The course includes design of a patient safety study, the evaluation of data, and the use of results from program evaluation to implement improvements to ongoing programs. This course provides an introduction to methods and techniques for conducting pharmacoeconomic studies. The course covers a wide range of topics, including risk adjustment, practical decision analysis, Markov modeling, meta-analysis, and indirect treatment comparisons. The class will involve numerous exercises from building simple decision trees to complex Monte-Carlo Markov models. This course will expose students to the traditional techniques used in descriptive and analytic epidemiology to describe and measure the negative impact of medication use. Students will learn how to apply pharmacoepidemiology concepts, such as pharmacovigilance, to minimize patients’ risk exposure. This course builds on PHA6276 Pharmacy Benefit Design & Management and probes development and operational management of a managed care prescription drug benefit program. Primary topics discussed include benefit design, formulary development and management, specialty pharmaceutical management, pharmaceutical contracting and pricing, Medicare Part D, Health Information Technology, qualify improvement programs, and accountable care and other shared-risk programs. This course introduces biostatistical concepts and methods used in pharmacy and medical literature. The overall goal of the course is for students to develop the ability to critically evaluate the statistical tests and results of relevant literature to identify findings that have implications for their practice. The purpose of this course is an introduction to analyzing medical and pharmacy data using programming techniques in SAS and SQL. This course will explore the features and complexities of medical and pharmacy data and will focus on all the corresponding aspects of the introductory/preparatory phases of the data life cycle in health economics and outcomes research, including importing and cleansing data, manipulating and creating new variables, merging data, and subsequently preparing a final analytic data set to address specific clinical questions related to a patient population to achieve the objectives of a research study. This course will also provide introductory exposure to generating descriptive statistics using SAS and SQL. Prerequisite: Completion of PHA 6283 Commercial Applications of Pharmacoeconomic Principles is required, and completion of PHA 6860 Pharmacoeconomic Modeling is recommended. Students should also complete PHA 6935 Quantitative Methods for Evidence Based Pharmacy unless they have previously completed a graduate-level statistics course. This course is an introduction to intermediate and advanced methods of analyzing healthcare data by exposure to utilizing clinical risk adjustment models in SAS currently used in industry. This course will further explore the features and complexities of medical and pharmacy data and build upon the Pharmaceutical Data Analysis in HEOR Settings I course by focusing on analyzing and interpreting patient outcomes in HEOR using sample data to complete the objectives of a research study. Prerequisite: Completion of PHA 6935 Pharmaceutical Data Analysis in HEOR Settings 1.